I would guess Woolly Hollow Falls drop around 40 or 50 feet from top to bottom, but not in a straight line. The stair-stepped falls make for good eye candy. Few things command ones undivided attention better than a waterfall. You don’t have to turn it on and you can’t turn it down, or off. And, in all likelihood you are viewing its magnificence voluntarily. Since it has your undivided attention, you might as well take advantage of the therapeutic benefits accrued while standing in awe of one of Mother Nature’s most powerful creations. Even better, it will not attack or bite and unless you decide to personally sample its turbulence, surviving the experience is a virtual lock. Waterfall therapy techniques are addressed along with some other pictures of the falls on the Photo of the Week page at Corndancer dot com. Get in on these revelations and photos by clicking here, a very cool thing to do. We are visiting the falls below the dam which makes 40 acre Lake Bennett at Woolly Hollow State Park near Greenbrier, Arkansas. 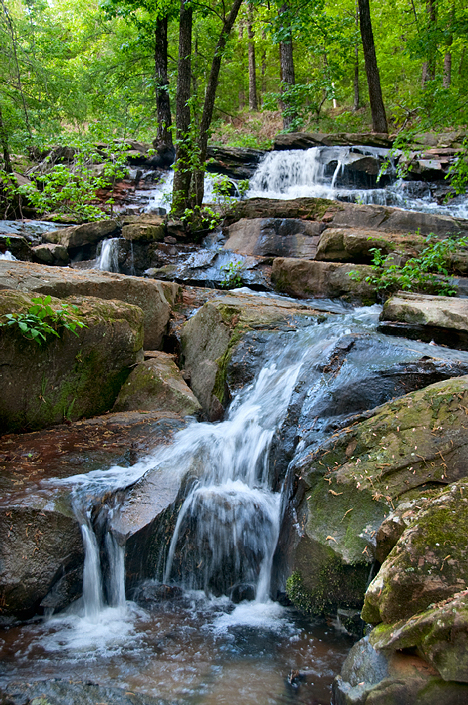 The falls are easily accessible from a trail near the entrance to the park. The park is very popular. There is an office and gift shop in the park which freely dispenses information about the premises. The top of the dam forming Lake Bennett. 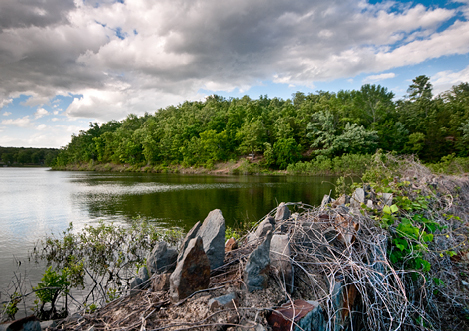 While the vegetation may look a bit unkempt, it is nature’s way and a good thing, adding its tendrils to the overall strength of the dam, which was built by the CCC in 1935. This is one of the few places were you see rip-rap embedded in concrete, pointy-side up. One presumes to prevent using the dam as a playground. While accessing the falls from the bottom is no trick due to the well constructed and tended trail, seeing if from the top at water level is another story all together. One descends from an impromptu parking place on the entrance road near the dam to the lake’s edge. From there follow the lake’s edge until you are even with the dam. At this water level, that required a small wade, not a big deal. 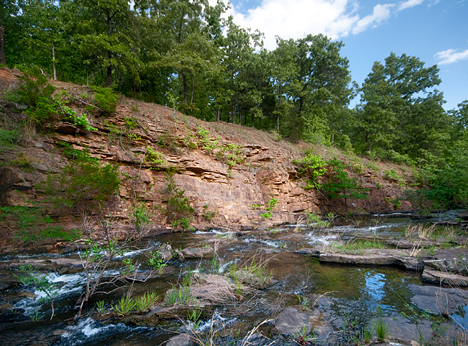 This bluff is just below and past the east end of the dam, and above the falls. From there, it would be better if you had the sure footedness of a mountain goat because the top of the dam is laced with rip-rap. 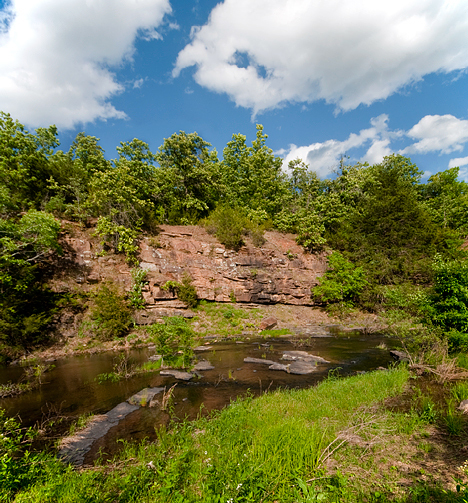 You gingerly walk across the top of the dam and wind up near the small bluff you see above. Traipsing across small rip-rap is not my strongest point, but the visual reward at the end of the walk was worth it. Not recommended for anyone with mobility limitations. Further downstream from the dam, this is the last stretch before the falls begin to drop. I decided here to curtail my southerly trek along the creek and return to the truck. It looked a tad woolier than I wanted to deal with, if you will forgive the pun. I followed the stream about another 75 yards or so. The trail was visible, but not well-worn. Not recommended if you take exception to wading and breaking your way through some underbrush. Since I have absolutely no objections to any of the above, I crashed on through like a bull in a china shop. When I got to the stretch of creek above, I shot and turned back, believing at my age that discretion indeed may be the better part of valor. The drop of the falls was not far ahead, but substantially more easily accessible from the bottom. See high resolution versions of all Corndancer and Weekly Grist pictures in our weekly high-resolution gallery. Click here to go there. This week we are including a black and white version of all pictures in this gallery. 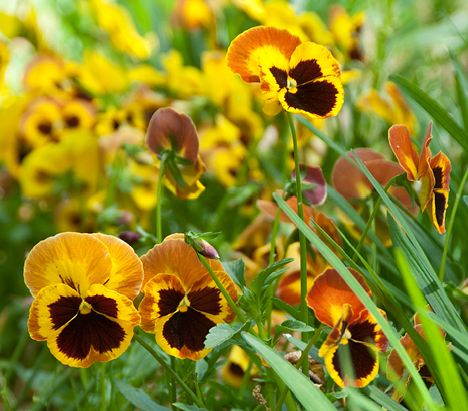 My neighbor advised me as to the name of these pansies which I promptly forgot since they reminded me of Yosemite Sam. So as far as I'm concerned, these are Yosemite Sam Pansies. 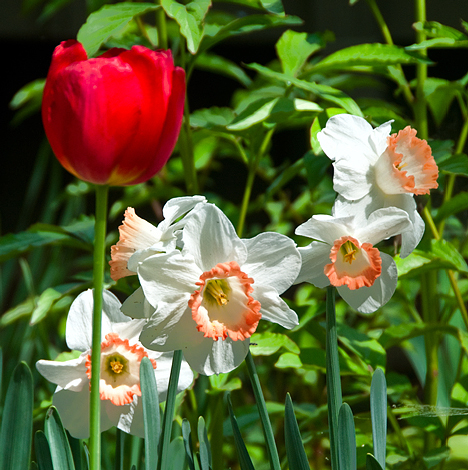 Spring, even as late as it is has been coming to full force this year, is a colorful event in our neighborhood. 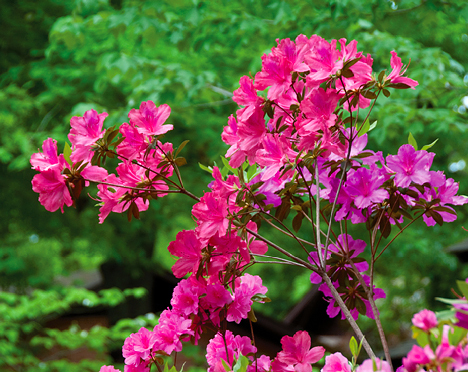 Every home has blooming azaleas in the front yard. But one person, my neighbor across the street, whose azaleas are the largest and most prolific of the aggregation, does not stop at that. 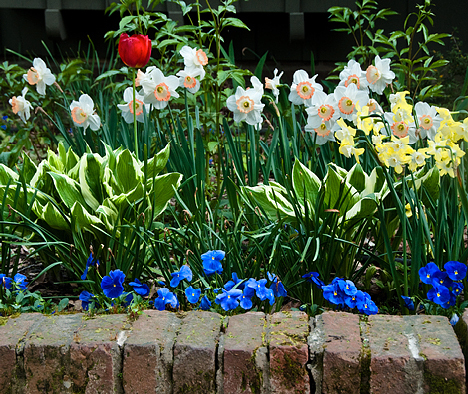 A master gardener, her premises is her canvas. Her husband plays a willing and supporting role. The story of this storied premises started on the Photo of the Week page at Corndancer Dot Com, where you will find pictures of Chinese Orchids and a few flowery comments which eventually turn a bit acerbic. Click here to go there. This azalea, much taller than my mere 6'-3" frame, is the current crowning glory of the neighbors front yard. There are other plants and bushes, but this is the top of the pecking order. Azaleas, despite my callous disregard for their well being, do pretty well in my yard. 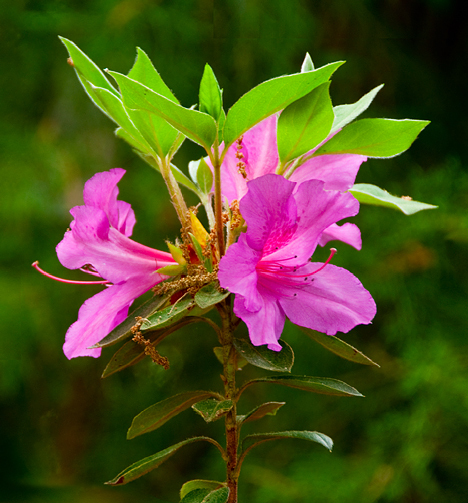 I'm certain it is the acidic soil which azaleas like. This one was here when I bought the house more than 24 years ago. It is a hardy thing. This one posie appears to be more than eight feet in the air. Back to the neighbors back yard. 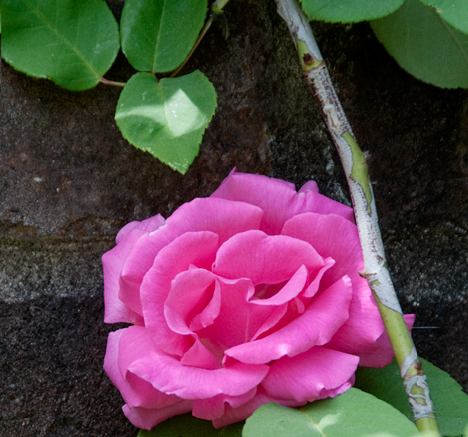 This is a climbing rose has attached itself to a brick wall. Jutting out about five feet or so from the aforementioned brick wall, this flower was waving in the wind on its thorny tendril as I attempted to shoot it. Finally got lucky, with this exposure. Back to the Yosemite Sam pansies. 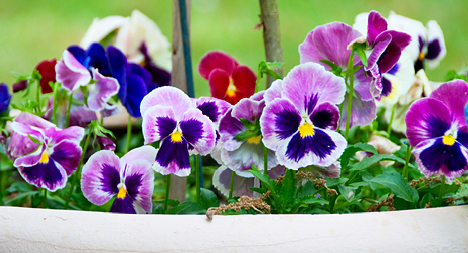 The pot of pansies here reminds one of a basket of puppies saying "take me home." 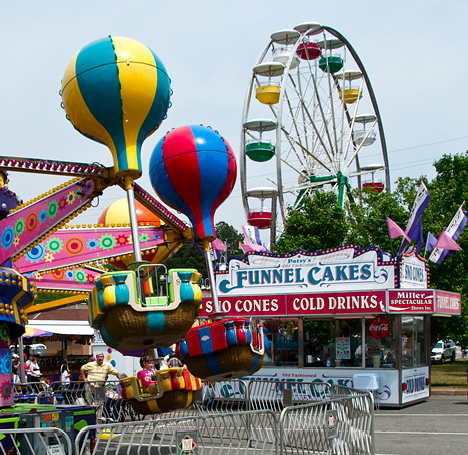 And finally, another sure sign of spring are small-town spring festivals. The picture below is from “Star Daze,” in Star City, Arkansas, the first in these parts. The folks there do a good job of organizing the event. It continues to grow and draw good crowds. In this end of the world, funnel cakes despite their non-health food status are far preferable to funnel clouds. See a high resolution gallery of the photos we’ve included this week on Corndancer and Weekly Grist, plus one that did not get published on either site. These are higher quality than what you see on here. Click here to go there. This week, we let the pictures do the talking for the most part. 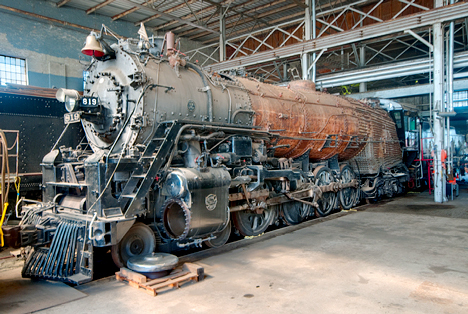 Engine 819, restored in 1986 to original operating condition and put into service for special steam locomotive rail trips lies idle in the Arkansas Railroad Museum in Pine Bluff, Arkansas, after a partial dis-assembly for a Federal Railroad Administration inspection, it fell victim to rising metal prices and a shortage of funds to complete the necessary repairs. In its heyday, the 819 pulled trains with the best of them. It is one of the last steam locomotives built for main line use and was absolutely the last steam locomotive built in the Cotton Belt St. Louis and Southwestern Railroad (more popularly known as the Cotton Belt), shops in Pine Bluff, Arkansas. To get a few more details about the life, times, and a picure of the restored 819, visit the Photo of the Week page at Corndancer dot com, where this story started. Click here to go there. We’ll wait here. The 819, once proudly restored, fell victim to ballooning metal prices and a dwindling pool of knowledgeable volunteer labor. The restoration effort started in 1983 and was completed by 1986, led by current and retired employees of the Cotton Belt, many of whom worked in the steam locomotive area of the Pine Bluff shops. The driver wheels on the 819 are about shoulder high to my 6'-3" frame.You can probably see some faint chalk lines in a checkerboard pattern on the side of the boiler. These are to facilitate the ultrasound inspection. See the next picture below for details. By 1993, when the engine was sidelined to undergo its mandated 15-year inspection, the number of steam-experienced volunteers had begun to shrink. At the same time, world metal prices went through the roof. To make matters worse, a short time thereafter, the Cotton Belt changed hands and some of the shop facilities which afforded help to the 819 volunteer corps were relocated or shut down. Not a good thing when you have a 212-ton steam locomotive lying around in parts. 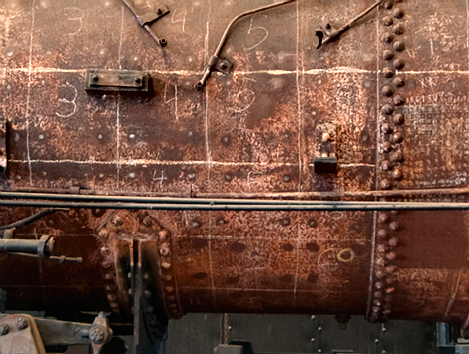 The chalk grid on the side of the 819 boiler are to facilitate the ultrasound test of the boiler plate. The ultrasound test is completed by the square foot. If an anomaly is detected in a given square foot, that square foot must be divided into square inches and retested to isolate the anomaly. None of the square feet on the 819 boiler required the square inch trick. Not to shabby for a 67-year old boiler. Disregard the appearance, the old girl is in good condition. Members of the Cotton Belt Rail Historical Society, caretakers for the 819, tell me that as far as the inspection went, it went well and the old girl passed with flying colors. After the inspection was nearly complete, their ultrasound machine went on the fritz, so in addition to everything else, they are waiting on that repair to materialize. Despite some daunting odds, don’t look for long faces in Cotton Belt Rail Historical Society, They know what they are up against and know it is up to them to do something about it. That being so, they never stop looking for sources of help and support to get the 819 back where it belongs … pulling cars of happy people over the railroads of America. See all of this week’s Weekly Grist and Corndancer pictures, plus a few not published, in glorious, high resolution color. The collection includes a couple of T-Model Ford shots and a freshly painted diesel locomotive seen at the Arkansas Railroad Museum. Click here to go there. THE YELLOW PERIL — Pollen, primarily from oak trees in bloom, about one day's worth, covers the hood of my wife's vehicle in our carport. This yellow onslaught will go on for another couple of weeks until the oaks are satisfied that their reproductive cycle is finished or a hard rain beats the "catkins" from the trees. Until either of these alternatives occur, the landscape is yellow and sinuses are clogged. You will also notice a plethora of cat tracks. At this residence, no vehicle hood is complete without cat tracks. There are thirteen mature oaks in my yard, not a bad thing in the summer time when they afford a lot of welcome shade. Our yard, in this neighborhood, with regard to oak population, is far from atypical. The neighborhood is called “Southern Pines.” It should be called “mega-oaks manor.” The shade and stately appearance of these wonderful trees comes at a price. And it is yellow. 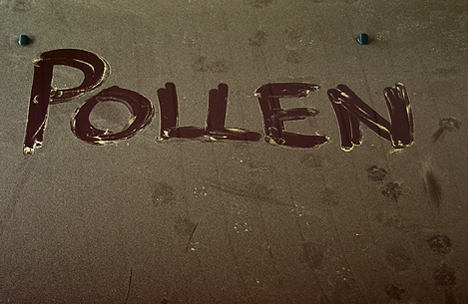 These trees produce pollen by the ton. In the early spring, it covers everything in sight. 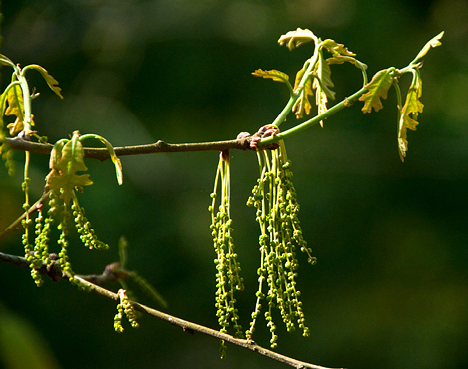 THESE ARE THE VILLAINS — The spindly dangling male oak flowers ("catkins"), produce pollen by the ton. In our neighborhood, there must be millions of these dust devil flowers. They are working day and night to cover their known universe with fine yellow spoor. They are good at their job. Oaks make baby oaks with male and female flowers adjacent to each other on their annual new growth twigs. The male flowers are called “catkins.” The catkins are the pollen producers. They dangle from new growth twigs to take advantage of spring winds, not bees, to distribute their genetic heritage. The little girl flowers eventually turn into acorns once the boys pepper them with pollen. This system of reproduction is a model of efficiency. Don’t hide, the devilish dust delights in finding you. It permeates every nook and cranny. This particulate plunder is tempered only by the thought that two weeks of yellow dust is the price we pay for late spring, summer and early fall shade. Probably not a bad deal. On the other hand, dear Mother Nature provides visual delights to distract one from the yellow peril. 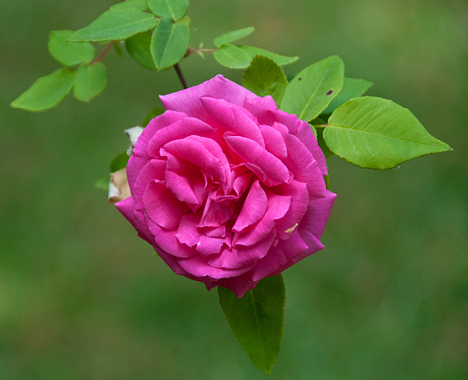 The beneficial blessings of these delights are substantially amplified when your neighbor is a master gardener (and you are a total loss in the yard). MY NEIGHBOR, THE MASTER GARDNER, plied her skills masterfully in this flower bed beneath her kitchen window. Because of the preponderance of massive oaks in our neighborhood, it is my observation that the ground is so poor, you have to fertilize the house to raise the windows. To create this grand garden, my neighbors filled this bed with fertile soils and amendments foreign to the neighborhood – not without a price – the initial irrigation was provided by volumes of good honest sweat. It's hard to argue with the results. If blooms could talk. The towering tulip looks like a commander reviewing the troops. Trees and flowers remind us that everything comes with a price. There are no free lunches. Would that more in our world could understand this simple concept. Click here to see high resolution versions of this week’s Corndancer and Weekly Grist pictures, including a couple of Dempsey cats.